Traveling to Cambodia is easy, but knowing a few essentials before arrival will help you navigate the tangles and traps that often snare tourists on their first visits. Tourism in Cambodia is on the rise. With double-digit growth in recent years, over 6 million tourists visited Cambodia in 2018. Not bad, especially considering Cambodia's population was estimated to be 16.2 million in 2018. Many of those international tourists proceed directly to Angkor Wat near Siem Reap. But along with practical information for visiting Cambodia, you should know a little about Cambodia's struggle to recover after decades of war and bloodshed. Grab a copy of the book First They Killed My Father by Loung Ung for a moving, firsthand account of the atrocities Cambodia faced not too long ago. Instead of comparing the infrastructure to that in Thailand—a bigger, never-colonized neighbor—be amazed at what Cambodia has accomplished. Cambodia, home to the once-powerful Khmer Empire, has literally taken a beating in the last 500 years. Despite being the most dominant power in the region for centuries, Cambodia fell to Ayutthaya (modern-day Thailand) in the 15th century. Since then, a number of conflicts were fought in or around Cambodia, leaving far too many orphans, land mines, and unexploded ordinance behind. Cambodia was made a protectorate of France between 1863 and 1953; further suffering was brought on by the Vietnam War. Pol Pot and his bloody Khmer Rouge are attributed with the deaths of over two million people between 1975 and 1979. Along with war, a mending economy and extreme poverty gave rise to a real problem of corruption. Tourists who begin their Southeast Asia travels in Thailand often make the mistake of comparing Cambodia's infrastructure, cuisine, and other aspects of culture to what they experienced in Thailand. Although there is much more to see when traveling in Cambodia, the ancient ruins of Angkor temples dating back to the 12th century are the crown jewel for tourism. Angkor Wat is considered the largest religious monument in the world and even appears on Cambodia's flag. Located near modern-day Siem Reap, Angkor was the seat of the mighty Khmer Empire that peaked between the 9th and 15th centuries until the city was sacked in 1431. Today, Angkor Wat is protected as one of Southeast Asia's most impressive UNESCO World Heritage Sites. Containing both Hindu and Buddhist temples spread over many miles of jungle, the bas-reliefs and statues depict scenes from mythology, providing a small glimpse of the ancient Khmer civilization. Although the main site is impressive, it is also perpetually busy—especially during high season between November and April. Fortunately, intrepid travelers still have the option to visit the many unrestored temples located away from the main site. Cambodia has around a dozen overland border crossings with neighboring Thailand, Laos, and Vietnam. But the easiest way to reach Cambodia with the least amount of hassle is via a budget flight to Siem Reap or the capital, Phnom Penh. Plenty of inexpensive flights are available from Bangkok and Kuala Lumpur. If your primary plan is to see Angkor Wat, flying into Siem Reap is easiest, although flights tend to be more expensive relative to the short time spent in the air. Phnom Penh is connected to Siem Reap via bus (5–6 hours) and speedboat. A visa for Cambodia can be arranged online before travel via the Cambodian e-visa website. Citizens from many approved countries can also get a 30-day visa on arrival at the airport in Siem Reap or Phnom Penh. Visa on arrival is available at some of the major land border crossings but not all. Two passport-sized photos are required as well as the application fee. The official price for a visa should be around US $30–35. Officials prefer if you pay the application fee in U.S. dollars. You may be charged more for paying in Thai baht. 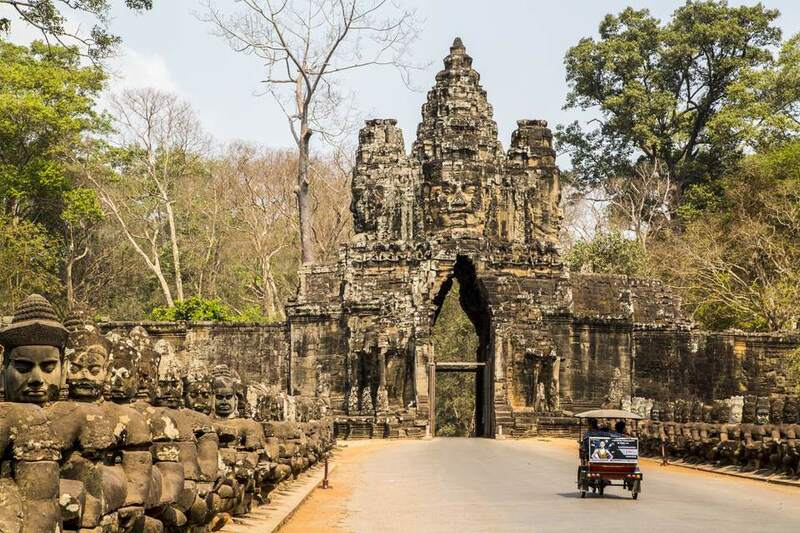 Tip: Some of the oldest scams in Southeast Asia happen to travelers crossing into Cambodia. Border officials have been known to change the visa application fees on a whim; all prefer if you pay with U.S. dollars. If paying with Thai baht, be mindful of the exchange rate you are given and hold out for the official entry fee. Your change will be returned in Cambodian riels and subject to the exchange rate in an official's head. It's better to pay the exact fee if you can. The official currency in Cambodia is the Cambodian riel (KHR), but U.S. dollars are widely accepted and circulated. Both are accepted interchangeably, however, dollars are preferred in many cases. You'll see prices in urban and tourist areas quoted in dollars. Thai baht is used in some places, particularly nearer the borders. Try to carry smaller denominations of Cambodian riel and U.S. dollars at all times. Horde your small change! Your U.S. dollars should be in relatively good condition without tears or excessive damage. Instead of U.S. coins, you'll usually be given change back in riel, meaning you'll have to keep an eye on whatever exchange rate is worked out for each transaction. Western-networked ATMs are widespread throughout Cambodia; the most common networks are Cirrus, Maestro, and Plus. Expect to pay a fee between of up to $5 per transaction on top of whatever your bank charges. Credit cards are only accepted in large hotels and at some tour agencies. It's always safer to use cash (card skimming can be a problem in Cambodia) and stick to using ATMs in public places, ideally those attached to bank branches. Like most of Asia, Cambodia has a culture of haggling. Prices for everything from souvenirs to hotel rooms can generally be negotiated. Plan to use up your Cambodian riel before leaving the country because it cannot be exchanged. The riel is practically useless outside of Cambodia. Although there are not any officially required vaccinations to enter Cambodia, you should have the usual, recommended vaccinations for Asia. Hep A, Hep B, typhoid, and tetanus (often combined with others into a Tdap vaccination) are generally recommended. Mosquito-borne dengue fever is a serious problem in Cambodia. The vaccine for dengue fever is currently only recommended for people who have already had a bout of the fever. You should protect yourself by learning how to avoid mosquito bites. For the most part, Cambodia has two dominant seasons: wet and dry. Unless air conditioning is to blame, rarely will you ever be cold while in Cambodia. The dry season and peak months for visiting are between November and April. Temperatures in April can exceed 103 degrees Fahrenheit! The rain begins sometime in May or June after the hottest months to cool things down. Heavy monsoon rains make a lot of mud, shut down roads, and greatly contribute to the mosquito problem. The best months for visiting Angkor Wat are also the busiest because of the number of sunny days. January typically has the least number of rainy days. Avoid mentioning or asking questions that may cause locals to become uncomfortable. Controversial topics include: war, politics, the Khmer Rouge, the problem of land mines, and other subjects that could trigger dark memories. Avoid supporting unsustainable practices such as child begging or the many children selling souvenirs to tourists. Don't buy souvenirs made from insects, shells, or wildlife; these cause further damage to the environment. Practicing sustainable travel is especially important in Cambodia. The water in Cambodia is unsafe to drink. Bottled water can be purchased everywhere; always check the seal before drinking. Although marijuana is very easy to find (you can order it on pizzas in Siem Reap), all drugs are illegal in Cambodia just as they are in Thailand. Petty theft (most often in the form of motorbike-based bag snatching) can be a nuisance in Cambodia. Don't keep your smartphone sticking out of your pocket, and watch out for your purse or daybag while riding in tuk-tuks. Although busy with tourism, Angkor Wat is still a religious monument used by worshippers. You will encounter many monks there. Dress appropriately and follow the usual rules of temple etiquette. The entrance fees for Angkor Wat increased significantly in 2017. You can now pay for passes by credit card at the ticketing counter (hours: 05:30–5 p.m.). You'll need a single passport photo.